If you have ever played in the dirt, or have gone fishing as a kid, you will know what an earthworm looks like. But, have you ever wondered what their role in life might be? I guess if they are used as fish bait, one might think that their role could be to help catch a wonderfully healthy supper. While that might be true, I was thinking more along the lines of what their biological role is in agriculture, as a whole. As a farmer, you need to understand and appreciate these great helpers for the value that they bring. Of the many wonderful benefits that earthworms will give you, if you treat them properly, they will aerate your soil, they will increase the level of plant available nutrients, they will enhance biological activity, they will create pathways for root growth and they will improve soil structure. Wow! Did you know that what earthworms ingest as food gets transformed into a highly available and balanced form of nutrition for your plants? Earthworms truly are a little fertilizer factory and the benefits of high earthworm population in your soil are both surprising and intriguing. I urge you to take a shovel out to your field this spring and do a little digging. As you count the number of earthworms in each shovel full, you should see 15 or more healthy worms every time you pull up some soil. So, what can you do if your numbers are low, you ask? 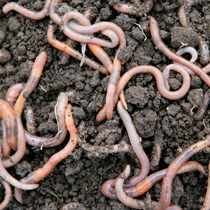 Take some time to follow a few proven methods to increase your earthworm population. Providing a good environment and adequate food source to these workers is a good start. You can do this by reducing tillage, planting cover crops, utilizing crop residues, and applying our MaxMix and TrueBlend Soil Rejuvenators. In addition, you should make every effort to reduce compaction in the field, reduce chemical inputs and use natural, bio-stimulating crop fertilizers that will enhance your soil life.